Apparently not content to simply see if artificial intelligences can can compete with humans in the art of conversation, IEEE symposium organizers want to see if AIs can compete in an equally human pursuit: war. 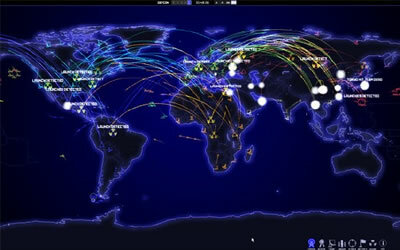 DEFCON is a real-time strategy game developed in Britain; a set number of players are shown a world map, provided with an arsenal of nuclear and conventional weapons, and given the objective of destroying as much of the population of every other player's country's population as possible. The goal is to see if an artificial intelligence program can fool a panel of human judges into thinking that the AI is a human player. Twentieth century homo sapiens arrived at a characteristically human strategy called MAD - mutually assured destruction - and decided not to play. 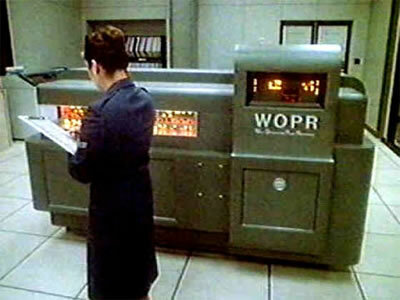 SF fans of course recall the famous War Operation Plan Response computer, also known as the WOPR, from the 1983 movie WarGames. Even though this movie is a quarter-century old, I'm still going to warn you that I'm about to spoil the ending for you. The WOPR, given the chance to play Global Thermonuclear War for real, decides that the only winning option is not to play. Apparently, the IEEE symposium on Computational Intelligence and Games is determined instead to create SKYNET, a somewhat more malevolent AI with a co-starring role in the Terminator movies. A group of talented programmers will pitch their DEFCON bot against enemy bots in a series of one-on-one thermonuclear chess games. The winner is the programmer whose bot successfully annihilates its opponents and racks up the highest death count. IEEE is offering a $500 prize to the deadliest DEFCON AI bot competition winner.